We're still looking at two rounds of winter weather this week. The computer models have been all over the place on this, so here's my best shot. To make things easier, I decided to split the snow forecast map in two, to better represent what you'll see each day. Light snow moves in during the morning. It'll start before sunrise in western Maine, and move into eastern Maine during the morning. With cold air in place, roads will get covered with snow and become slippery. 1 to 3 inches of snow is expected for most; 3 to 6 inches for the mountains, where it’ll be a fluffier snow that can stack up. Temperatures will warm above freezing near the coast by afternoon. 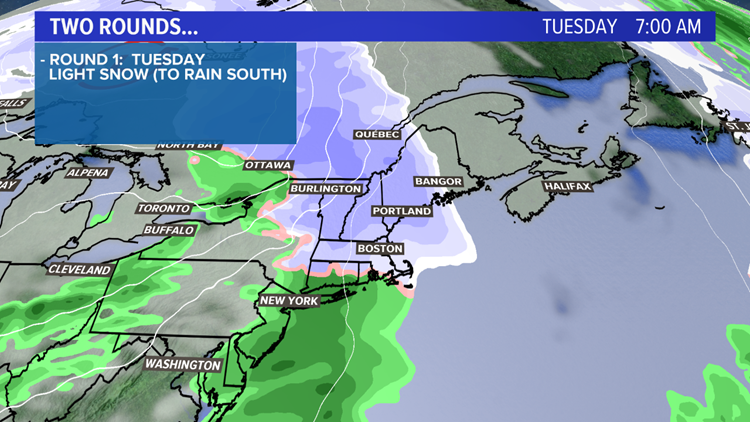 The snow will taper to rain showers and drizzle in southern Maine. Farther inland, occasional snow showers will continue into the afternoon. 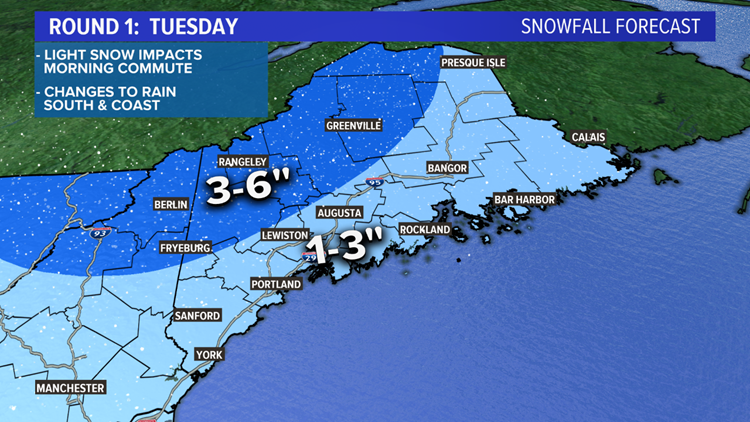 Here are the expected snow totals for Tuesday only. 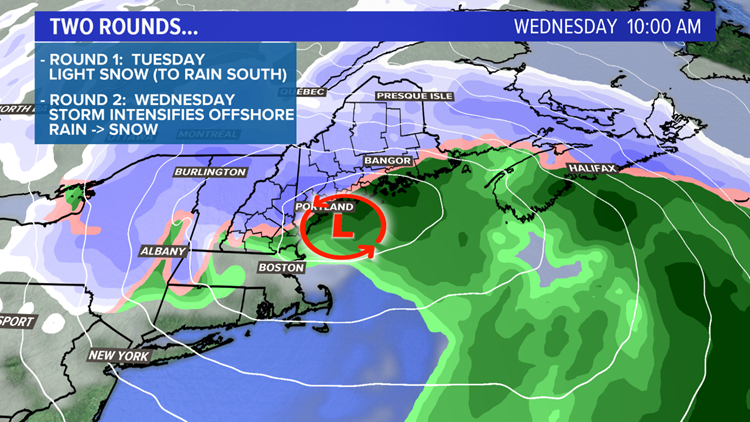 It looks like a stronger storm will form in the Gulf of Maine, throwing heavier precipitation back into the state beginning after midnight Tuesday night, going into Wednesday. It may be warm enough to start as rain near the coast. Inland, heavy snow is looking more likely Wednesday morning. Again the morning commute looks very messy and school cancellations may be necessary. This round alone could amount to another 4 to 8 inches, especially in the foothills and mountains. 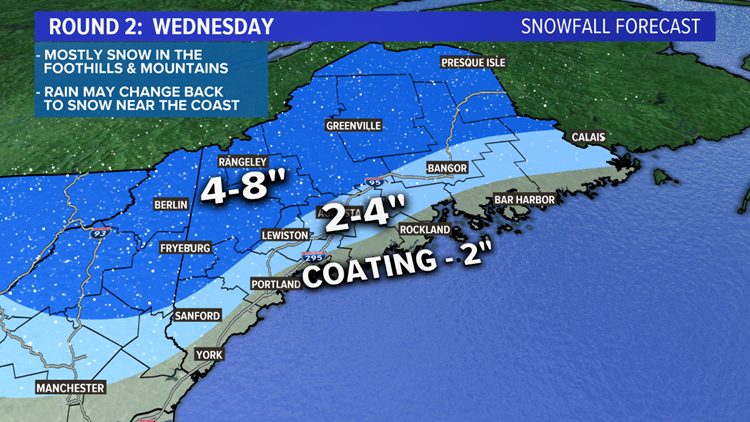 Near the coast, rain may change to snow during the day Wednesday, as the storm drags colder air back in. This is the most difficult part of the forecast at this point. Here's what I expect to fall on Wednesday. Please stay with us. As we all know, this has been a challenging forecast!